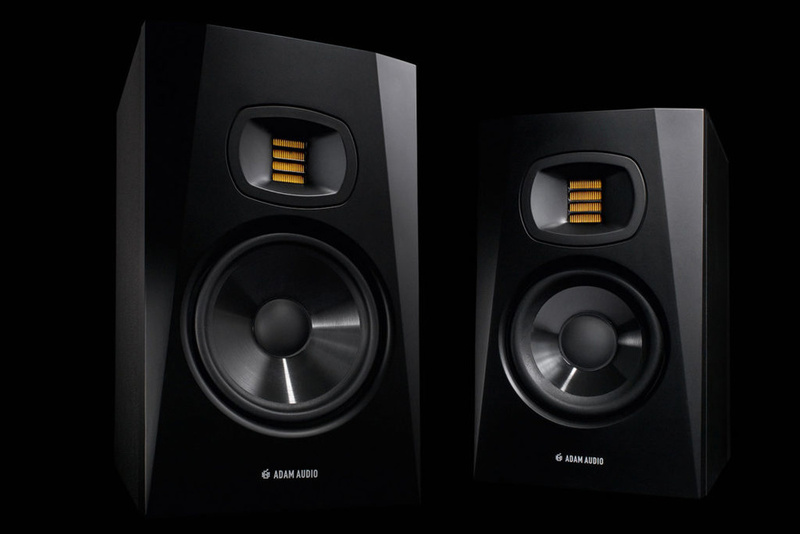 Having set themselves the challenge of creating a more affordable nearfield monitor that nevertheless retains the high performance and technical innovation of their more upscale ranges, ADAM Audio have come up with the T Series. The new range consists of two models, the T5V and T7V. These active, two-way nearfield monitors feature many of ADAM’s signature touches, including a new folded ribbon tweeter design, and the German company say that they will deliver the kind of extended frequency response and low distortion previously unthinkable on a tighter budget. The T Series monitors are equipped with the new U-ART 1.9-inch accelerated ribbon tweeter. Based on the S-ART tweeter found in the flagship S Series, the U-ART is said to offer many of the same benefits, including high efficiency, low distortion and a frequency response that reaches up to 25kHz. It’s housed inside ADAM’s High-frequency Propagation System (HPS) waveguide, designed for wide, consistent horizontal and vertical dispersion. The idea here is to provide a wide stereo image and minimize wave reflections. The latter should make it easier to position the monitors in less than ideal environments, such as bedrooms. The T5V’s five-inch woofer and the T7V’s seven-inch woofer also use a new design featuring a lightweight, symmetrical-excursion polypropylene cone, promising a linear frequency response down to 39 and 45 Hz respectively. Other features include a rear-firing bass port, a DSP-controlled crossover (3kHz for T5V, 2.6 for T7V), Class-D amplifiers (bi-amped 50 for lo and 20 for top), high and low shelf filters (+2 and -2dB) for room adjustment, and balanced (XLR) and unbalanced (RCA) line inputs. The T5V and T7V will be available from late March priced at £299 and £349 respectively, per pair and carry a generous five-year warranty.The T5V and T7V will be available soon at $199 and $249 respectively, each and carry a generous five-year warranty.